Back in the ‘90s, in a Shanghai flea market, I came across a set of faded postcards depicting a cache of 1930s Chinese Art Deco buildings that I’d never seen before. I assumed that they were long gone. Not at all, said the seller: They stood in an area shaped like a cross in northern Shanghai, and the surrounding road names all began with one of the characters Zhong, Hua, Min, Guo, Shang, Hai, Shi, Zheng or Fu: Republic of China Shanghai Municipal Government. This was Republic of China President Chiang Kai-Shek’s Greater Shanghai Plan – his Shanghai dream. Of course, I went to see them, and of course, they were magnificent. But what was the story? By the time the Republic of China, or the Nationalists, had united most of the country under their rule in 1928, Shanghai was already an internationally renowned city – but its renown came from its foreign concessions, in stark contrast to the poor, underdeveloped ‘Chinese Shanghai’ outside of the international areas. It was a national shame, and the Nationalists proposed to address it with a planned civic centre: a new, prosperous Chinese Shanghai. 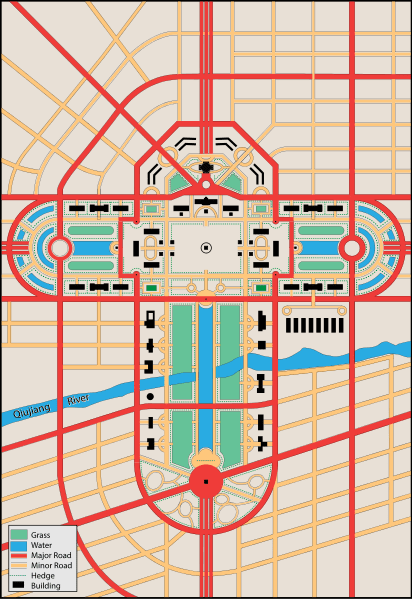 The Greater Shanghai Plan, conceived in 1929. Land was acquired in an undeveloped northeastern quarter of Shanghai, in what is today’s Jiangwan, and the city’s first urban plan was conceived. It was, ostensibly, a Chinese planned city for Chinese people, with a directive to design in “traditional Chinese style.” Yet Shanghai was already a cosmopolitan melting pot, and the urban planners and architects included Americans, Germans, and Chinese trained in both places. Indeed, the very inspiration of the plan was foreign: it came from Ebenezer Howard’s Garden Cities of Tomorrow, a description of a planned urban utopia, in which man lived in harmony with nature – an idea which also influenced prominent town planners such as Frederick Law Olmsted, who designed Central Park in New York. Greater Shanghai Plan buildings designed in the cosmopolitan, East-meets-West Chinese Art Deco style by an architect steeped in both traditions fit perfectly. Dong Dayou (he anglicized his name to Dayu Doon) had attended Tsinghua, the University of Minnesota and Columbia, before returning to Shanghai in 1928, where he established an architectural practice with the American architect and urban planner Asa Emory Philips. Significantly, Dong also worked with Henry K. Murphy, the American architect who was a firm advocate of adapting traditional Chinese styles for modern usage, and who Chiang had hired to design a modern capital for him in Nanjing. 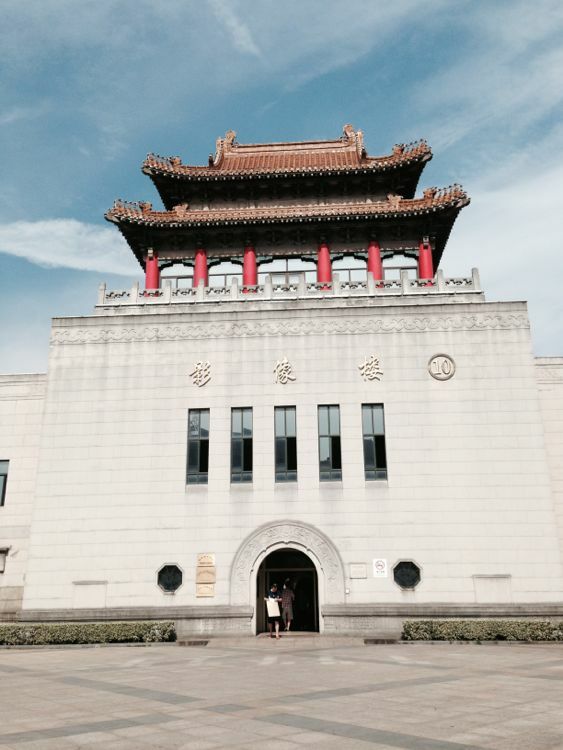 The former Greater Shanghai Municipal Museum, 1935, fused East and West. 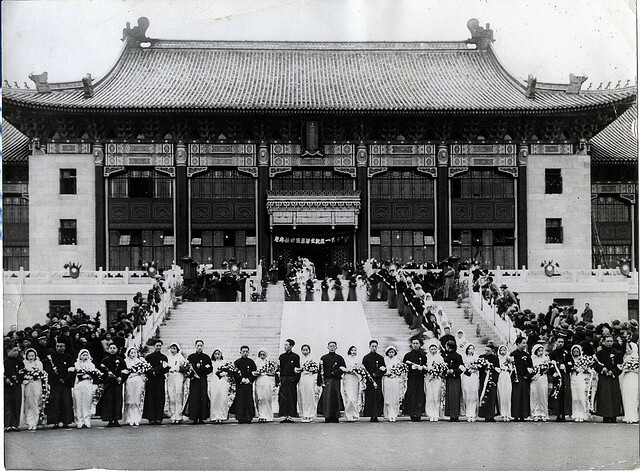 Dong’s designs for the new City Hall fused the latest international modernist and Art Deco styles with classical Chinese architecture, a metaphor, he said, for the spirit of this new age. Describing the Greater Shanghai Plan buildings, he said, “Instead of aiming at a reproduction of old styles, an attempt is made to apply and modify features suitable to modern needs.” It was a style alternately called Chinese Renaissance or Ming Revival, and much beloved by the Nationalist government, who applied it to their government buildings in Nanjing, as well. This fusion was new, the work of a generation of young Chinese architects trained abroad. 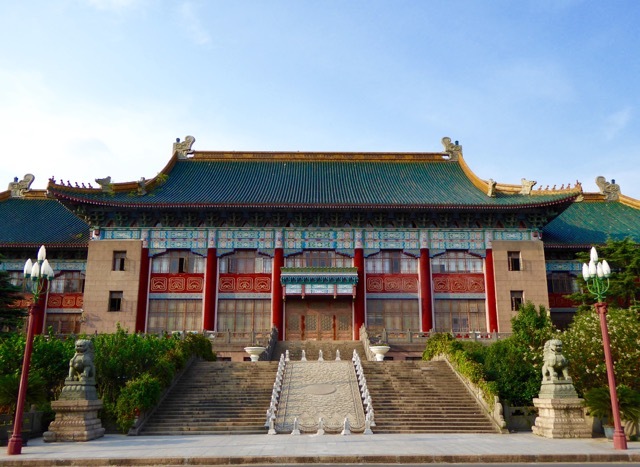 Traditional Chinese architecture required only masons and carpenters, while the engineering required of larger structures invariably resulted in western designs. “They [the architects] initiated a movement to bring a dead architecture to life: in other words, to do away with poor imitations of western architecture and to make Chinese architecture truly national,” says Dong. And so the new city’s administrative and cultural center was carefully laid out across four square kilometers in the shape of a cross. (Why a cross? Well, Chiang-kai shek had become a Christian in 1930…) Here was the Greater Shanghai Municipality’s City Hall, Museum, Library, Stadium, Gymnasium and Natatorium, Hospital, Courthouse, Government Headquarters — nine buildings in all, gathered around a 20-acre plaza and reflected in a pool of water a third of a mile long – inspired, perhaps, by the famous Lincoln Memorial Reflecting Pool in Washington, D.C., which had been completed less than a decade earlier. Skirmishes with the Japanese had been mounting, interrupting the construction of City Hall, and by 1937 much of the construction on the Greater Shanghai Plan subsided, never to resume. The courthouse was never built, nor the city government building, nor the reflecting pool. 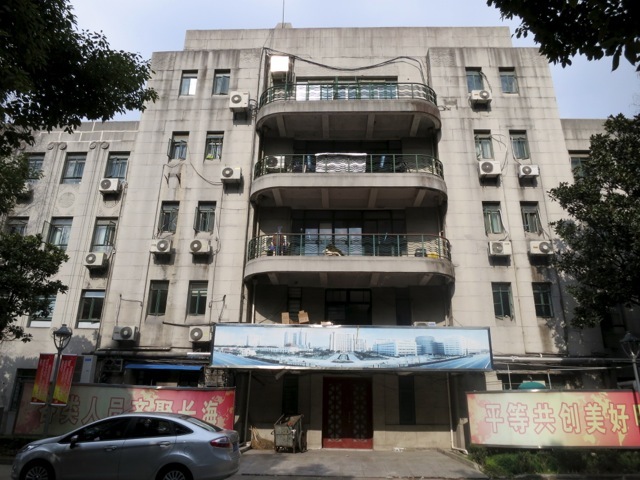 The Japanese occupied the buildings during the war and after the war, in 1945, the Chinese municipality moved its offices to the former Shanghai Municipal Council building on Jiangxi Lu. The new Communist government, too, turned its back on this purpose-built city and chose to set up their offices in what had been the power center of foreign Shanghai: the former Hong Kong and Shanghai Bank building on the Bund. The Greater Shanghai Plan faded into history. Today, Jiangwan lies far enough away from the city center that wandering the wide boulevards, punctuated with the surprise of grand, Chinese Art Deco buildings, feels like an adventure. 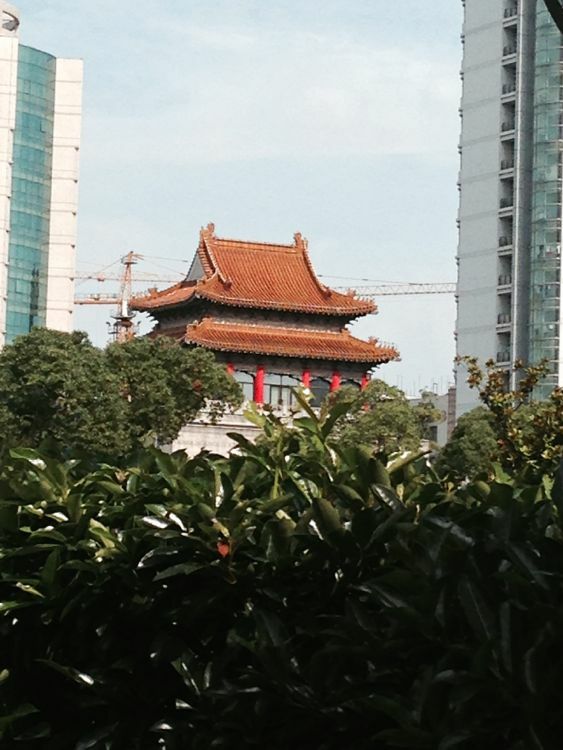 The buildings are in various states of repair, yet the bold vision of the Greater Shanghai Plan is intact. “The startling architecture of the new City Hall indicate that East and West have met in wedlock.” – Fortune magazine, 1935. Dong tweaked the proportions, raising the central portion of the roof and streamlining. 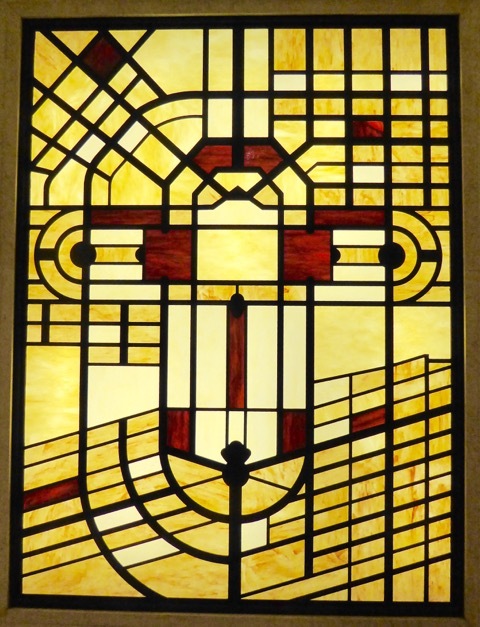 Traditional decorations, too, are streamlined and stylised, highlighting the geometric shapes that define Art Deco. In the spacious lobby, a map of Shanghai remains in the ochre terrazo, with a small depiction of the Greater Shanghai Plan cross. In 1935, it was the spectacular backdrop for the first ‘collective wedding’, with 57 couples and over 700 residents. The first collective wedding, in front of City Hall, April 3, 1935. From the steps of City Hall, across the treetops that have grown since these buildings were opened, the imperial yellow roof tiles of the Greater Shanghai Municipal Museum glint to the southeast, and those of its twin, the Greater Shanghai Municipal Library, to the southwest. Dong’s designs for these buildings took into account the needs for modern amenities within such as overhead lighting, and thus in this broad building, “only the central portion is emphasized by a “gate-tower” covered with a yellow tile roof,” he says, adding, “The omission of the heavy roof on the rest of the building is due to a measure of economy.” The former Museum is today part of Shanghai Second Military University and Changhai Hospital, imperial echoes executed in Chinese Art Deco, from the angular staircases to the brightly painted ceiling medallions and stylized characters on the terrazo. The former Greater Shanghai Municipal Museum. 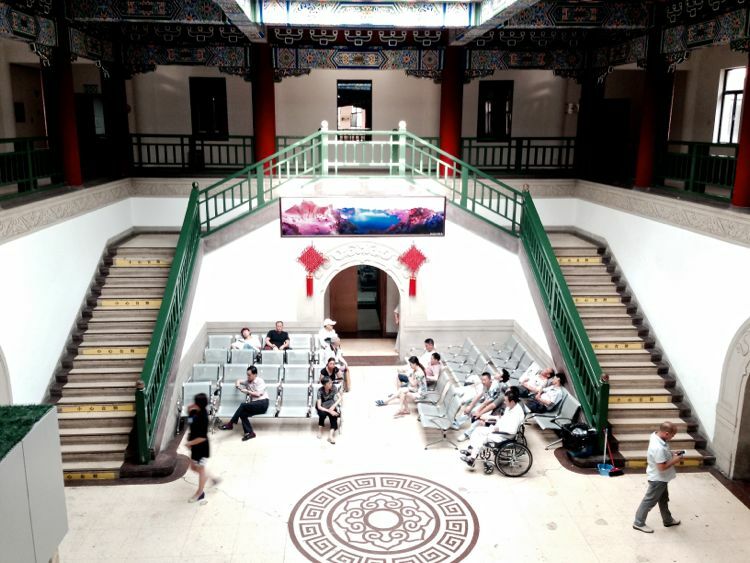 Greater Shanghai Municipal Museum, interior. The terrazo design is a Chinese compass rose, featuring the four directions. The Greater Shanghai Municipal Library served as the library for Tongji Middle School until 2008; on my first visit there, floppy-haired teenagers played basketball in the courtyard. Today it lies empty and neglected, weeds growing from the tiled roof, but grand plans are afoot. 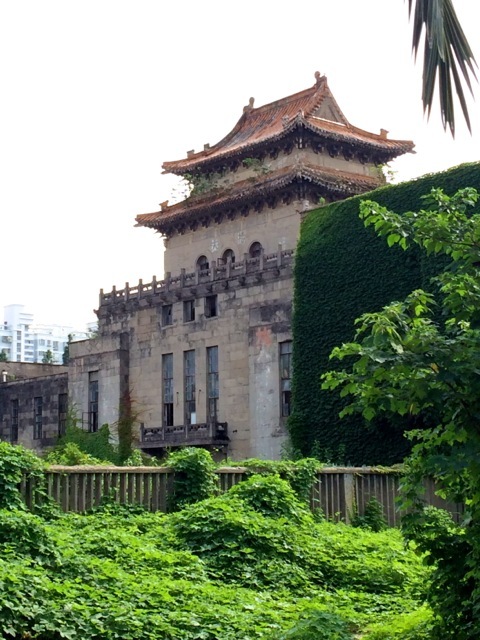 The library, which was never completed, but still opened and held 10,000 volumes, will be restored to its original purpose for the residents of Yangpu district, and include an exhibition on its history. Set to open by 2017, the new library will feature two new wings, to be built according to Dong’s blueprints for the original library. 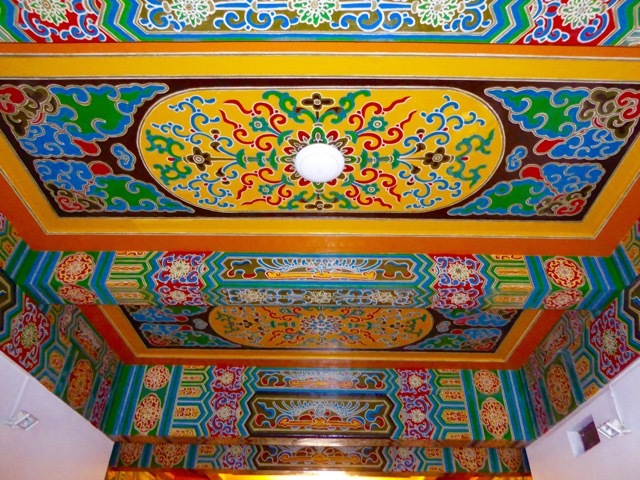 Perhaps it signals a Ming Revival revival ~ or at least an appreciation of its legacy. 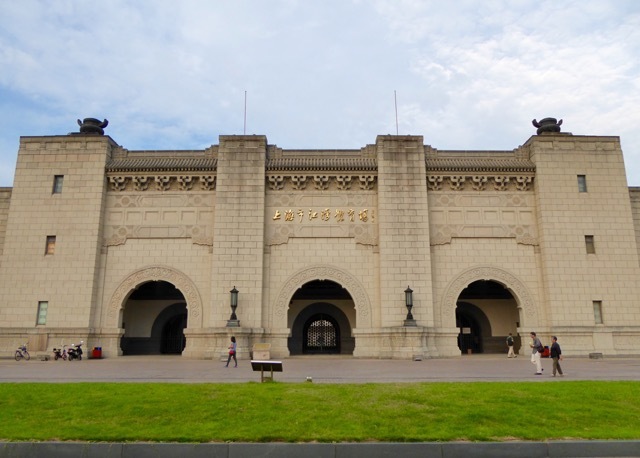 The Greater Shanghai Municipal Stadium, completed in 1935, was designed to be the place to host national events – but it is large enough, and grand enough to host something much bigger. After all, the Nationalists dreamed big, and had just sent off the very first Chinese delegation ever to the Los Angeles Olympics in 1932. Who’s to say an Olympics in Shanghai was not part of their plan? 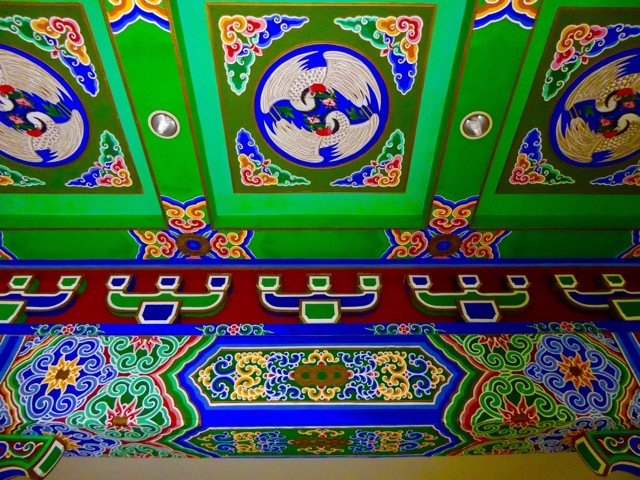 And what better place to showcase this new China than in Dong’s Chinese Art Deco stadium? Today, Olympic dreams behind it, the stadium is still used for sports, including the X Games, and a golf putting range is set up on the grass. Greater Shanghai Municipal Plan in the stained glass of the former clubhouse, in the Stadium. Photos: Robert Bryan. 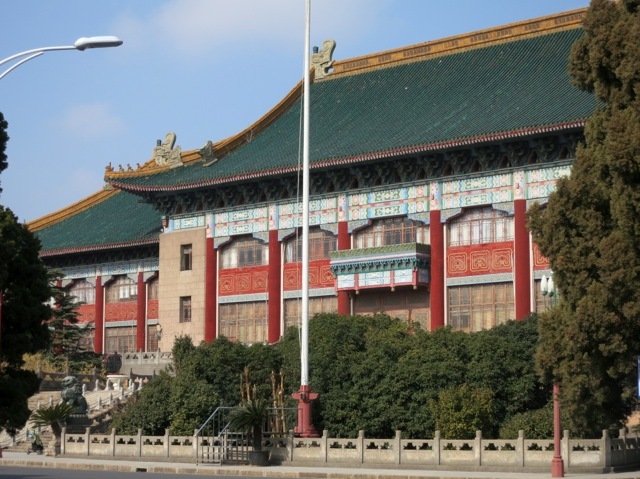 The Stadium, the gymnasium and Natatorium, and Changhai Hospital are another style of Chinese Art Deco – Art Deco forms with Chinese motifs. Said Dong, “These show the possibilities of adapting Chinese decorative features to modern structures.” Indeed, their classic Art Deco profile from afar looks western, but up close, decorative elements in the gateway and the terrazo all feature Chinese motifs. 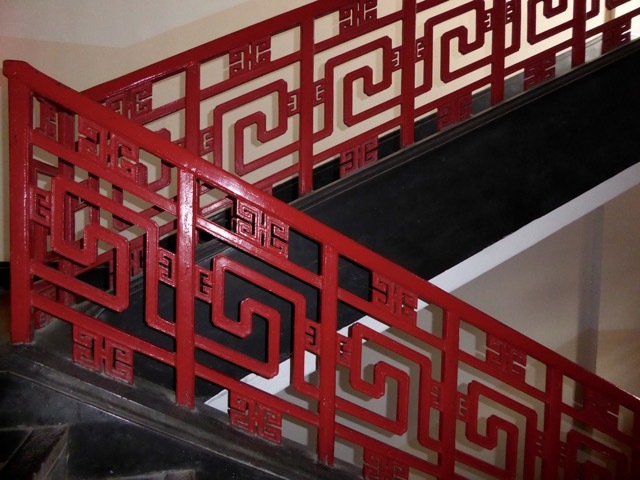 Stylized “shou” or long-life motifs on Changhai Hospital. Dong’s cleverest Art Deco building, though, is the one he created for the China Civil Aviation Association. Shaped like an airplane, one of the classic symbols of the Art Deco era, its shape was only visible from above – that is, from an airplane. 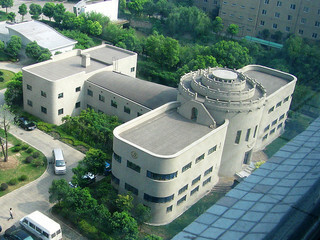 Civil Aviation building. Photo: John Meckley. The Greater Shanghai Plan is a forgotten chapter in this city’s rich and layered history – and an architectural legacy well worth rediscovering. Cody, Jeffrey W., Building in China: Henry K. Murphy’s “Adaptive Architecture”, 1914-1935, The Chinese University Press, 2001. Denison, Edward and Guang Yu Ren, Building Shanghai: The Story of China’s Gateway, Wiley-Academy, 2006. Denison, Edward and Guang Yu Ren, Modernism in China: Architectural Visions and Revolutions, John Wiley & Sons Ltd., 2008. Doon Dayun, Architecture Chronicle, China Heritage Quarterly, No. 22, June 2010. Fortune, January 1935, in Tales of Old Shanghai. Zhang Yun, Remnants of a City’s Dreams, Global Times, July 10, 2013. Michelle Qiao, Shanghai’s First City Hall, Cultural-China.com. 5 Reasons Not to Miss Manila Art Deco Weekend!